One of the first agreements to return antiquities to Italy was made with the Metropolitan Museum of Art in New York (February 21, 2006) [Press Release]. The discussion has tended to centre around the Sarpedon krater but there were other pieces as well. Laconian cup with warrior. Attributed to the Hunt painter. Formerly New York 1999.527. Gift from the family of Howard J. Barnet. "Lent to the Museum periodically since 1981" (Mertens). Publ. Joan R. Mertens, in "Ancient World", The Metropolitan Museum of Art Bulletin, New Series, 58, No. 2, Recent Acquisitions: A Selection 1999-2000 (Autumn, 2000), 13 [JSTOR]. (Nostoi no. 3; old no. 3). Attic red figure psykter with young horsemen. Attributed to Smikros (attributed by J. Robert Guy). Formerly New York L1980.104 (loan from Mr & Mrs Spears, Riverdale [NY]); 1996.250. Gift of Thomas A. and Colette Spears. Publ. Dietrich von Bothmer, in "Ancient World", The Metropolitan Museum of Art Bulletin , New Series, 55, No. 2, Recent Acquisitions: A Selection 1996-1997 (Autumn, 1997) 12 [JSTOR]. (Nostoi no. 15; old no. 14). Attic red figure amphora with cithara player. Attributed to the Berlin painter. Sold at auction, Sotheby's (London), December 13-14, 1982, lot 220. Formerly New York 1985.11.5. Publ. Dietrich von Bothmer, in "Greek and Roman Art", Recent Acquisitions (Metropolitan Museum of Art) (1985-1986), 9 [JSTOR]. (Nostoi no. 17; old no. 16). Apulian red-figured dinos with Herakles and Busiris. Attributed to the Darius painter. Formerly New York 1984.11.7. Purchase, The Bothmer Purchase Fund, Rogers Fund, and Norbert Schimmel and Helen H. Mertens Gifts, 1984; Anonymous Gift, 1989. Dietrich von Bothmer, "Greek and Roman Art", Notable Acquisitions (Metropolitan Museum of Art) (1984-1985), 6-7 [JSTOR]. (Nostoi no. 57; old no. 51). Entry revised: August 21, 2008. Image courtesy of New York, Metropolitan Museum of Art (www.metmuseum.org). Dinos with Herakles and Busiris, ca. 340–320 B.C. ; Red-figure. Greek, South Italian, Apulian. Attributed to the Darius Painter. Terracotta; H. 9 3/4 in. (24.79 cm). Purchase, The Bothmer Purchase Fund, Rogers Fund, and Norbert Schimmel and Helen H. Mertens Gifts, 1984; Anonymous Gift, 1989 (1984.11.7). 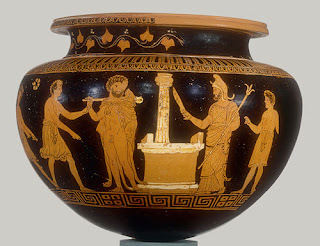 The amphora attributed to the Berlin painter was sold at the same Sotheby's auction as the Lucanian nestoris returned by Boston MFA (1998.588). Were they consigned by the same person?